Forex prices, or quotes, include a "Bid" and "Ask" similar to other financial products. Bid is the price at which a trader is able to sell a currency pair. The Bid price or sell price of a currency pair is always the lower price in a quote. Ask, sometimes referred to as "Offer", is then the price at which traders are able to buy a currency pair. In other words, Forex traders always buy at the high and sell at the low of a price quote. The difference between the Bid and Ask is called the "Spread" or "Pip Spread", which is the Trader's cost per trade or per transaction. There are typically not additional broker commissions involved in trading the Forex market, as there might be when trading other investment markets. 2. The value of the base currency is always 1 (one). A quote of USD/JPY at 116.04 is to say that 1 US Dollar (USD) = 116.04 Japanese Yen (JPY). When the US dollar is the base unit and a currency pair's price increases, comparatively the dollar has appreciated and the other currency in the pair (usually known as the cross currency) has weakened. Using the above USD/JPY example as a reference, if the USD/JPY increases from 116.04 to 117.51 (147 pips), the dollar is stronger because it will now buy more yen than before. There are four currency pairs involving the US dollar in which the US dollar is not the base currency. These exceptions are the Australian dollar (AUD), the British Pound (GBP), the Euro (EUR), and the New Zealand dollar (NZD). 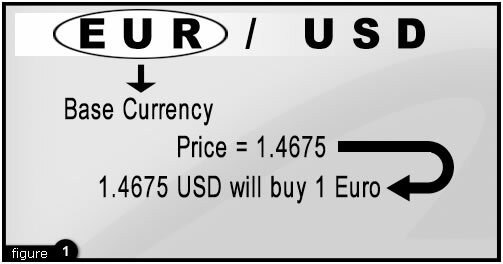 A quote on the GBP/USD of 1.7600 would mean that one British Pound is equal to 1.7600 US dollars. If the price of a currency pair increases the value of the base currency in comparison to the cross currency thus increases. Conversely, if the price of a currency pair decreases, such is to say that the value of the base currency in comparison to cross currency has weakened. Forex markets and prices are mainly influenced by international trade and investment flows. The Forex market is also influenced, but to a lesser extent, by the same factors that influence the equity and bond markets: economic and political conditions, especially interest rates, inflation, and political stability, or as if often the case, political instability. Though economic factors do have long term affects, it is often the immediate reaction that causes daily price volatility, which makes Forex trading very attractive to intra-day traders. Currency trading can offer investors another layer of diversification. Trading currencies can be viewed as a means to protect against adverse movements in the equity and bond markets, movements that of course also impact mutual funds. You should bear in mind that trading in the off-exchange foreign currency market is one of the riskiest forms of trading and you should only invest a small portion of your risk capital in this market.